Ex-Guatemalan President Extradited To U.S. : The Two-Way Alfonso Portillo was taken from a hospital bed in Guatemala City and flown to New York to face charges of laundering $70 million through U.S. banks. 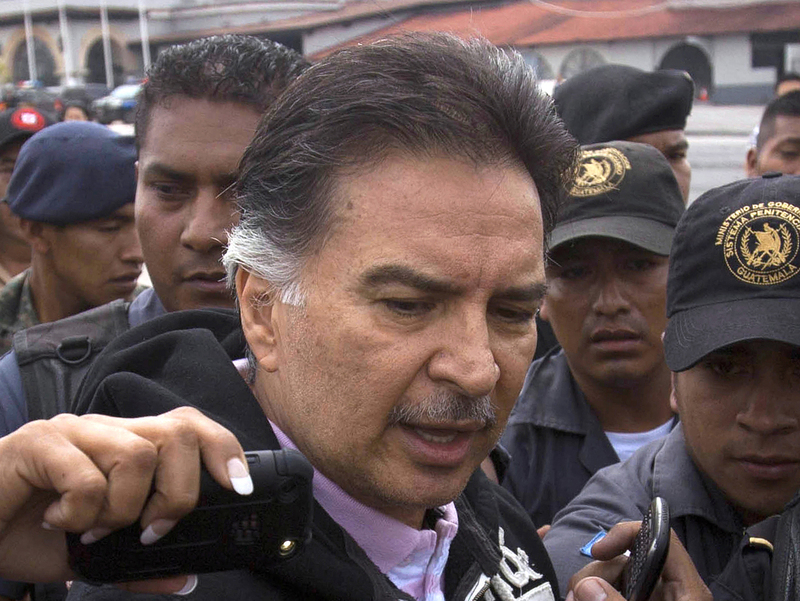 Ex-Guatemalan President Extradited To U.S.
Former Guatemalan President Alfonso Portillo speaks with journalists in Guatemala City before boarding a plane for the U.S. on Friday. Former Guatemalan President Alfonso Portillo has been extradited to the United States, where he faces charges of laundering tens of millions of dollars through U.S. banks. Portillo, who served as president from 2000 to 2004, was snatched from a hospital bed in Guatemala City, where he was recovering from liver surgery. He was placed on an airplane bound for New York, according to his lawyer, Mauricio Berreondo. The former president is accused of laundering $70 million in Guatemalan funds through U.S. banks. He was taken from the military hospital on orders of Interior Secretary Mauricio Lopez Bonilla, Berreondo said. "I blame the government for what could happen to him," the lawyer said. "Portillo is sick and there are several pending appeals." "This decision is an important affirmation of the rule of law and due process in Guatemala," the U.S. Embassy in Guatemala said in a statement. "We commend the Guatemalan authorities in the strengthening of the rule of law and the fight against organized crime and corruption." In 2009, a U.S. grand jury said Portillo should face charges and Guatemala's supreme court endorsed an extradition request that was rubber-stamped by then-President Alvaro Colom, Reuters reports. Two years later, a Guatemalan court cleared Portillo of local embezzlement charges, but the U.S. extradition request stood. The Associated Press reports that "in the U.S. case, Portillo allegedly deposited the money in Miami and transferred it to a Paris account in the name of his ex-wife and daughter."